Stand with stomach relaxed (c’mon, you’re among friends here). 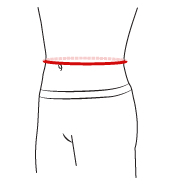 Measure the minimum circumference (skinniest part) in the waist area. Tape should be parallel with the floor.